​Rainhill Hall, now known as Loyola Hall, was occupied by the Stapleton-Bretherton family between 1884 and 1919. In the first half of the 19th century their ancestor, Bartholomew Bretherton who was a successful coach proprietor, built ‘The Hall’ and acquired much land in the area. 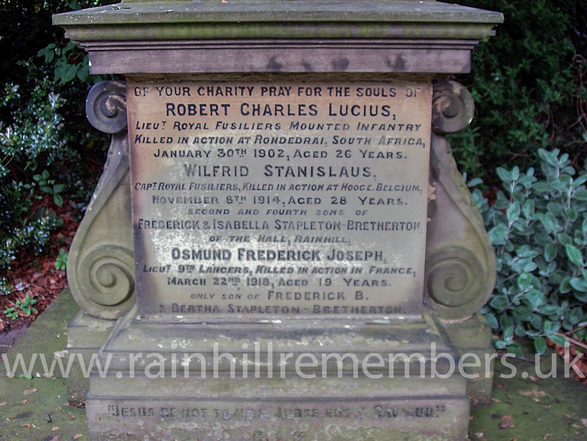 Bartholomew also established St Bartholomew’s Church and School in Rainhill. The family were staunch Roman Catholics. Frederick Annesley Stapleton-Bretherton (1841-1919) inherited ‘The Hall’ and the Rainhill Estate from his father’s cousin, Mary Stapleton-Bretherton**. She was the daughter of Bartholomew Bretherton. Frederick was married to Hon Isabella Petre and they had 13 children. Rainhill was the family seat, but Frederick and Isabella also had a house at Fareham near Southampton. During the Great War the whole family was caught up by the events happening in Europe. Many of the daughters married military or naval officers and the sons volunteered to fight for their country. Two sons Edmund and Vincent fought in WW1 and survived. A daughter, Evelyn, married a Prussian prince and spent the years 1914-1918 interned in Berlin. Edith married a career soldier, Roland Feilding, who spent most of the war years fighting in France. Winifred married Edward Charlton and Ethel married John Anthony Throckmorton – both naval officers. The youngest daughter, Gertrude, married Kenneth Dewar who served in the navy during WW1. Another daughter, Monica, spent the war years doing canteen work and working as a VAD nurse. Stapleton-Bretherton fought in the South African War during 1901. 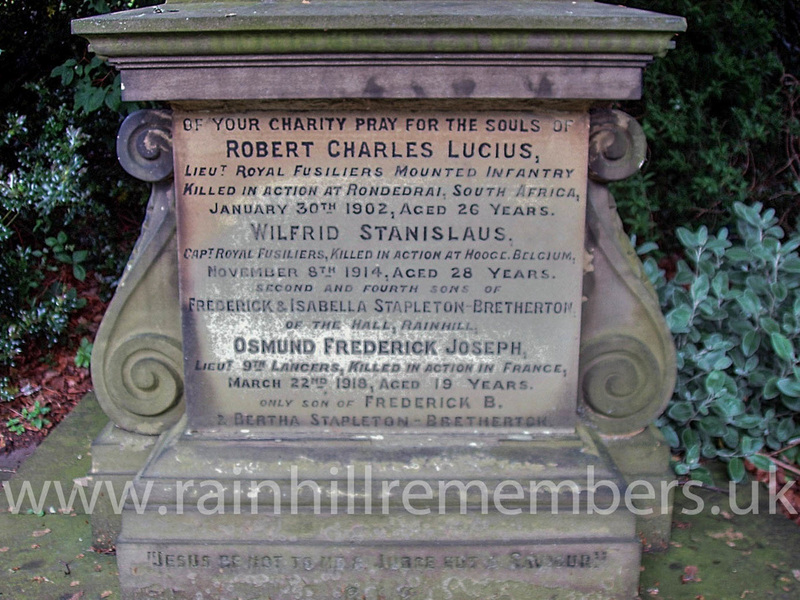 His brother, Lt. Robert Stapleton-Bretherton was killed in the Boer War in 1902 aged 26. Major Frederick Stapleton-Bretherton was also on active service during the First World War. Sadly his son, Lt. Osmund Stapleton-Bretherton was killed in action in France, aged 19, and a younger brother, Capt. Wilfrid Stapleton-Bretherton, was also killed in action in Belgium aged 28. Acknowledgement: Philena Bruce (descendant of Edith Stapleton-Bretherton) for valuable insights into the history of the family. Frederick Annesley Stapleton-Bretherton (1841-1919) married Hon. Isabella Petre (1845-1919) in 1869.